After 9 seasons of watching our favorite hopeless romantic and loyal friend Ted Mosby, we will finally get to see him meet the love of his life and live happily ever after. Or will we? How I Met Your Mother has easily become this generation’s version of Friends. The creators came up with a brilliant concept that not only dragged viewers through addicting cliff hangers year after year…but provided us with lovable and hilarious characters. The trail of breadcrumbs and clues leading to the mother’s identity was just a perpetual bonus alongside the shenanigans of Ted’s memorable gang. Barney, Robin, Lily & Marshal form a group of friends that although very distinct…relate just enough to your own clique of besties. I don’t think there is a single person out there who doesn’t want to live above the bar Maclarens with their best buds. A tear may be shed as we say goodbye to our favorite canadian pop-star, the Daddest architect, the best couple in the world, and the awesomest of awesome bro. Barney Stinson alone will go down in history as the woman chasing, suit-wearing, bro-code swearing, easily quotable character played by NPH. The point is, fans expect the series finale to be Legen….I hope you wanted milk with that…dary. Alright, enough of the sob-story worthy compliments. Let’s get down to the point. Two weeks ago in the episode titled Vesuvius, the writers gave us viewers the most bizarre hint…uhh reveal? (IDK what to even call it) in HIMYM history. 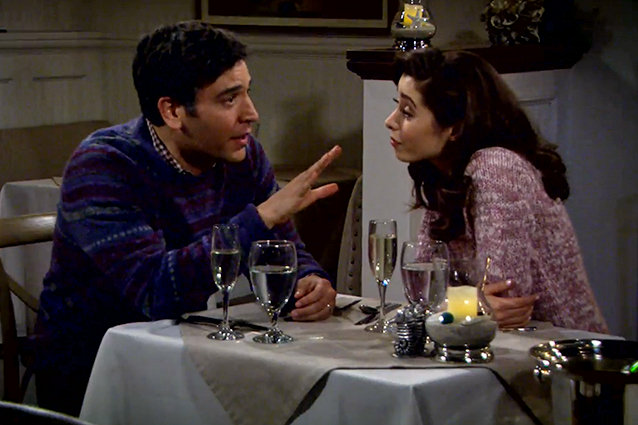 In a flash-forward to a conversation between Ted and his future wife in 2024, he tells her one of his many stories from Robin/Barney’s wedding. When he tells his wife that Robin’s mother did in fact show up for the wedding, the mother replied “What mother is going to miss her daughter’s wedding?” This then caused the revealing moment. Ted broke down and cried. WHYY? The mother immediately began to console Ted and try to make him laugh, as if to change the subject and take his mind off whatever this matter may be. Theories have been flooding the internet about why this may be. Theory 1: The BIGGEST question arising from this is: Has the Mother in fact been dead the entire time Ted has been telling his children this story? Is Ted crying because he knows his own wife will not live to see his daughter walk the aisle?? Is this the real reason why Ted has been telling the story to his kids the whole time? Many have theorized in the past the Mother has been dead, but this is the first time the show has actually hinted that this might be possible. Does the love of Ted’s life that he has oh so craved to find through years of heart break…really end up dying? This of course is the most morbid theory…but the writer’s are definitely trying to plant this idea into our heads whether its true or not. Theory 2: Perhaps Ted is crying because he worries that his own wife might not live to see his daughter walk the aisle. Key word in this theory: MIGHT. The writers probably want the finale to be just as much of a tear jerker as it is funny. So why not make us all believe that she might be dying. Perhaps we soon find out that she has a medical scare…and maybe this is why he is telling the kids the story. HOWEVER, she lives in the end. I really don’t think that the writers would create such a dark ending to such a positive show. Nor do I think CBS would be too jazzed with the idea that the mother dies. However, I think they LOVE the idea of tricking us all…making us cry our eyes out…then surprising us with the Mosby gift of life. Those jerks. Theory 3: Something is happening to Ted. We all automatically jump to conclusion that something is wrong with the mother, but what if Ted is the one in fact striken with some sort of condition? Ted seems to be on the brink of tears throughout entire episode (in the flashforwards). A key line in this episode is when the mother tells Ted, “I don’t want you to be the guy who lives in his stories. Life only moves forward.” For the 9 years we’ve known Ted, he is living in his stories from the past. He has a need to explain every detail of these stories to his children. Here’s a thought: Is Ted dying? No, I really don’t think Ted is dying. The emotions and interaction between Ted and the Mother did not seem like this was the case. As ridiculous as this may sound though…could Ted be acquiring Alzheimer’s? Or perhaps suffered from a brain injury? Maybe eventually, Ted’s memories are really all he has. For some reason, something in the future scares and sadden’s Ted. We do not know what this may be yet, however it clearly hurts Ted enough to make him cry. The writer’s could simply be trying to trick us, as they often do. This is a show known for its skill with misdirection. They successfully planted the seed to make us worry and theorize…kindof like Inception. I’m confident that the ending will be nothing less than beautiful. Whether the Mother is in fact dead or not, the writers have been waiting to give us this ending for 9 years. They will provide a finale absolutely satisfying to fans; even if it ends in tragedy, they will find a way to make it perfect. As we say goodbye to the characters we love, and finally learn how Ted meets the mother, I know that the writer’s will find a way to let us leave with a smile. P.S. There’s one slap left in Marshall and Barney’s slap-bet I’ll bet anyone 3 slaps…that the finale ends in a slap so epic that it shakes the world. P.S.S ….WHERE THE EFF IS THE PINEAPPLE FROM?